The title of the rather edifying blog No Unsacred Place keeps bugging me. 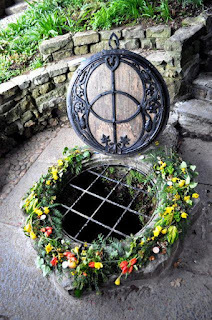 The phrase brings to my mind the little discussion that sometimes occurs inside Neopagan ritualism in which the idea of casting the circle or creating sacred space is questioned. The argument is that in a ‘nature religion’ all of existence must be the manifestation of the divine, and therefore human efforts to designate any particular space as sacred are at best redundant and at worst irreverent and presumptuous. To me this notion contains misunderstandings both theological and linguistic. Let’s do the linguistic first. “Sacred” is derived from Latinate roots that mean ‘to separate’ or ‘to cut off’. It refers especially to places or things that are made separate from common life and work, in order to be especially dedicated to the work of religion or magic or spirituality (as you like). The thing is, the essential point of ‘sacredness’ is its separation from the common. To use ‘sacred’ as a reference to unity is rather a contradiction in terms. To say that there is ‘No Unsacred Place’ – that everything is equally dedicated to the special work of religion, is essentially to say that nothing is, in fact, special. If nothing is unsacred, then nothing is sacred. The complement to this is found in the word ‘holy’. Holy is from the same Germanic roots that give us our English ‘whole’, ‘heal’ ‘health’ etc. It is perfectly reasonable to say that the entire cosmos is holy – wholly whole, and wholly holy, as somebody famous once said. “No unholy place’ makes plenty of sense, if you like. On another level, sacredness isn’t an intrinsic quality, it is an imparted one. In order for a thing or place to be sacred it has to be declared so, either by a spirit or by a human. My ritual robe is sacred not because of its cloth or its color, but because I have set it aside for the special work of spirituality Sometimes a god makes a mountain or river sacred, sometimes it is done by humans. In every case sacredness happens because some specific intelligence makes it so. To me this isn’t really a theological matter so much as a technical one. Religious methods are intended to induce spiritual experience in the participants. The technique of designating a specific space as the sacred space – the space where we can expect the gods and spirits to manifest – is basic and undeniable. As always, I assume that spirituality works by most of the same rules as material nature. If you diffuse your work thinly over a vast area you’re unlikely to get a useful result. Concentrating effort in a specific zone is the way to have real impact. So when I want a god to be present I make an image of the god and bring the god to be present specifically in the image. Note I don’t try to ‘have the divine be present’. The divine *is* always present, but unless it is concentrated in some specific form and place it is mainly irrelevant. Sacredness is about separateness, and without separateness there can be no sacredness. You're quite correct, in that the very definition of that which is sacred is that which has been separated out. I've been known to suggest that Eliade's division of sacred and profane isn't quite correct, but it is more correct than the implication that nothing is sacred because it is all sacred; an inescapable implication if we make the statement that all is sacred. The material world (all of it) certainly can be sacred. . . but not all at once. Aother way to say that is that it could all be sacred *to something*. So your driveway is sacred to your car... But that rather misses the colloquial point of 'sacred'. Thank the Gods for people who care what words mean! I have heard it explained by my teachers that although everything is "sacred," it's hard to remember that in ordinary doings; "creating" sacred space by casting circles and whatnot serves as a point of focus so it is easier for us to remember that sacrality. However, I think I like your distinction between "holy" and "sacred" even better. It's not really that "things" are not sacred or mundane, it's our momentary attitude toward them that qualifies something as sacred. Things, IMO, become sacred when we sacralize them by treating them as sacred, a.k.a. veneration. We venerate something and, as a consequence, it becomes more sacred since we perceive our enhanced relationship to that which we have venerated and it begets an escalated degree of sanctity to us. The more we venerate an object or principle, the more sacred it becomes. An awesome exploration, Ian, thanks! I'm not sure if you know this, but the name of the No Unsacred Place blog comes from a quote by Wendell Berry in which he says, "There are no unsacred places. There are only sacred places and desecrated places." To me, what Wendell Berry is doing here is drawing attention to the potential for any particular place to be sacred. The point is that, when we set something aside as special (as we've arguably done with all of nature by insisting that we, as humans, are separate from and better than the rest of nature), we can do so in a way that makes it sacred (ie that acknowledges its holiness, its own wholeness and relationship with the larger whole), or we can do it in a way that desecrates it, cutting it off from its holiness, treating it as something to be exploited or consumed. Anyway, a really wonderful and thought-provoking post! How would you feel about having it re-published over on No Unsacred Place as a guest post? As I've thought more, surely every place *could* be sacred. I guess my response was really to that little ritualism argument about whether what we're doing when casting a circle or opening a way is *making* the place sacred. I think I still think that the answer is yes. Wonderful, Ian. :) That'll be up tomorrow. Perfectly explained, Ian. The material world may indeed by holy, but the sacred is something 'special', something set apart. Holiness is intrinsic; sacred is the result of an act that we or the gods might perform. I agree with what Rachel has said.